Chart 1. Vote totals by party in the House for presidential and midterm years. 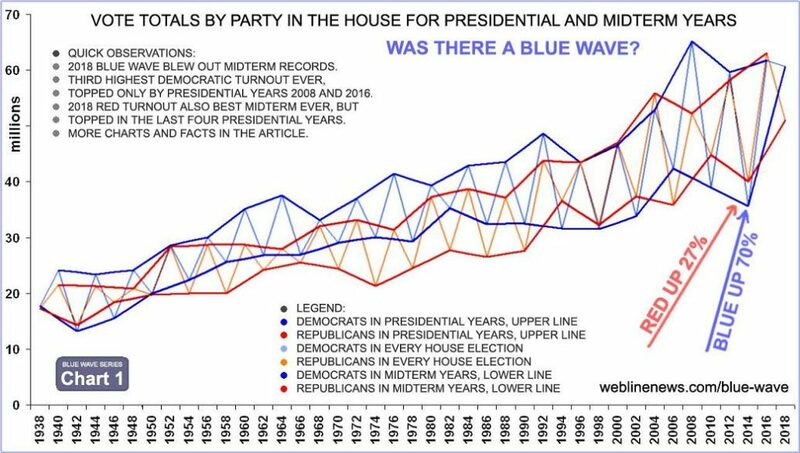 Blue 2018 midterm votes were much higher than ever before, 70 percent over 2014 midterm, unmistakable where the lower blue line moves nearly straight up on the far right side of graph. Blue 2018 midterm votes were surpassed only by presidential years 2008 and 2016. The 2018 blue wave even beat 2012 presidential year vote levels. Red 2018 midterm votes were also much higher than ever, increasing 27 percent. The lighter oscillating lines show that midterm vote levels drop off dramatically over presidential years, but blue 2018 votes dropped off only two percent from 2016, as can be seen by that little drop off on the right side. Comparing raw vote numbers is limited by the fact that population changes over time. Chart 2 corrects for this issue. Chart 2. Population turnout by party in the House for Presidential and Midterm Years. Chart 2 uses all same metrics as Chart 1 above, only this time, the measurement is population turnout. Population turnout equals votes divided by total population without adjustment. By converting to percentages, trends over time become fairly comparable. Blue 2018 turnout was much higher than ever before, 66 percent over 2014 midterm and 44% over average midterm turnout of both parties since 1938. 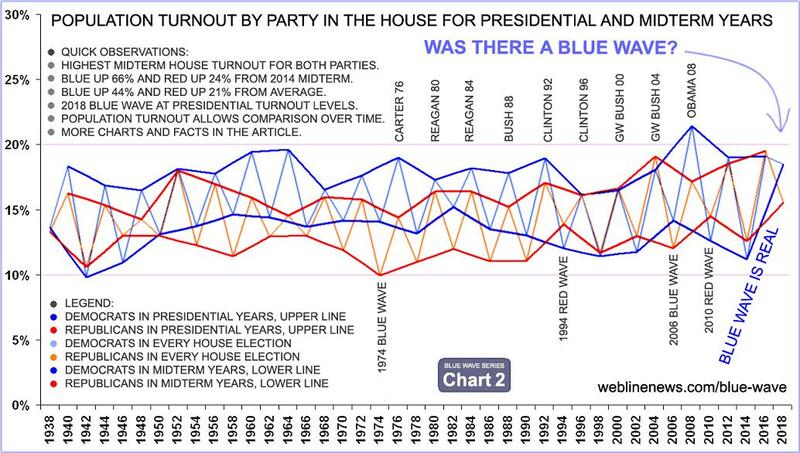 Blue 2018 turnout was 11th highest of all 82 data points since 1938 including presidential years, for example, more than blue turnout in 1996, 2000, and 2004. Red 2018 turnout was 41st of 82 points, right in the middle, but still the highest red midterm turnout ever, up 24 percent from red 2014 and 21% over average midterm turnout. Population turnout was (1) Blue at 18.5% and (2) Red at 15.5% for 2018. Population turnout for each party swings wildly between presidential and midterm elections, up an average of 35% in presidential years and down 26% in midterm years. Average blue turnout was 15.6%, with averages of 18.1% in presidential years and 13.3% in midterms. Average red turnout out was 14.4%, and 16.5% and 12.4% respectively. Democrats dominated House votes until 1994. Since then, races have been much more competitive. Democratic turnout between presidential years and midterms swings more than Republicans, especially in recent years. Once, party turnout surpassed 20 percent of population. The year was 2008 and Barack Obama was running for president. Blue turnout rose to nearly 22 percent. Twice, party turnout dropped below ten percent, 1942 blue and 1974 red. 1974 BLUE WAVE. Much has been said about the ‘1974 blue wave’ being the biggest wave ever. On Chart 2, it only comes out ninth biggest. The graph line slopes down from 1970 because blue turnout actually dropped. Still, 1974 had the highest Democratic percentage of party vote since 1938 at 58.55 percent. The real reason was not blue enthusiasm, but rather red discouragement. Republican Richard Nixon had just resigned during the Watergate scandal and red voter turnout slipped below ten percent for the only time. The red line slopes down more than the blue line. Chart 3. Population turnout by party, House versus president comparison. Democrats dominated House elections from 1940 through 1996. Republicans dominated the White House from 1968 through 1988, with Democrats only gaining the White House in 1976, fresh off the Watergate scandal. Until 1996, party votes between presidential and House picks did not track each other closely. As of 1996, the two flow closer together. In 2000 and 2016, Democrats won the popular vote but lost the White House. Republicans won the popular vote for both House and presidency only once. Democrats won both nine times. Chart 4. House popular vote percentage versus seats, Democratic Party. 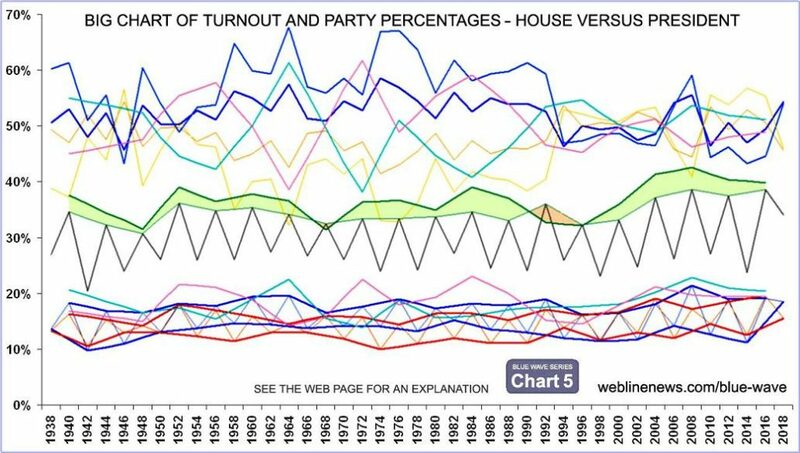 Chart 4 shows party percentage of the vote and compares percentage of seats after the election. Democrats are featured prominently with Republicans in yellow shadow because the lines are mirror images of each other. Average blue vote percentage was 52%, with 52.4% in presidential years and 51.7% in midterms. Average red vote percentage 48%, and 47.6% and 48.3% respectively. 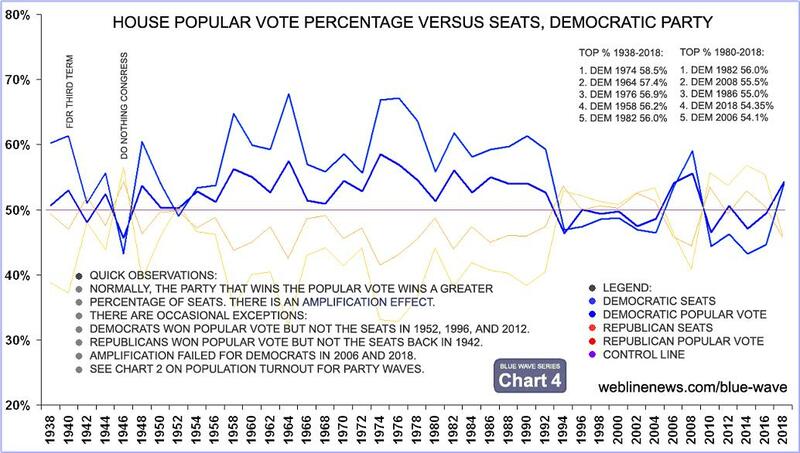 Democrats won the popular vote but not control of the House three times, in 1952, 1996, and 2012. Republicans won the vote but not seats back in 1942. Amplification failed for Democrats in 2006 and 2018, when the House win was a lower percentage than the popular vote win. This did not happen to Republicans. Chart 5. 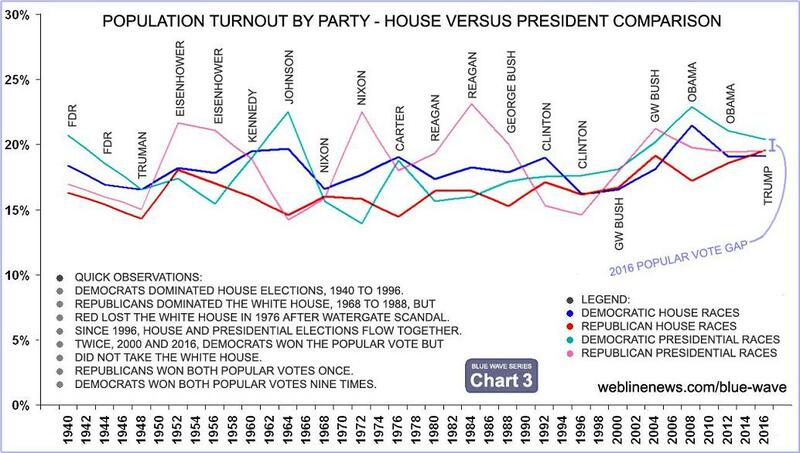 Big chart of turnout and party percentages – House versus president. This unlabeled chart for serious graph wonks shows the same data as above Charts 2 through 4, and adds a few things including combined party voter turnout and percentage. The upper section is the same as Chart 4, with additional lines for presidential percentages in light blue and pink. The lower section is a duplicate of Charts 2 and 3. The green and grey lines in the middle are combined turnout for both parties. Party presidential turnout exceeds party House turnout significantly, except 1968 and 1992 (shaded orange) when independent candidates took a chunk of the vote. The 1974 “blue wave” looks pretty large in the top section by vote percentage, but disappears in the lower section by population turnout. Likewise in other races, voter percentages alone mask turnout levels, as in 1956 when Eisenhower won reelection by a larger percentage but with a smaller population turnout.